Alcoa Foundation exists to serve the global company’s communities. Founded in 1952, its mission is to invest in residents’ quality of life. In 2008, Alcoa and the Alcoa Foundation gave over $50.6 million to communities in 35 countries, while the company’s employees volunteered over 705,000 hours to community service projects. The Foundation is committed to improving opportunities for women and girls. In the US, Alcoa works with Girls Inc., Boys and Girls Clubs, Girl Scouts and Big Brothers and Big Sisters. The goal is to empower young women to reach their full potential through programs in health, science, math, technology, economic and financial programs, and leadership skills. In Europe, Africa, and Asia, Alcoa Foundation continues this goal with vocational training and skills-building workshops, gender and equity training for teachers of young girls, encouraging female engineering students to continue in their fields, and providing basic health care services. Climate Change: Alcoa Foundation has provided $22 million in grants to build awareness and inform public policy. The Foundation partners with community organizations and funds outreach programs that address sustainability, energy use, water management, and development. Month of Service: The Alcoa Volunteers program encourages every employee to help make the world a better place. And they do: each October, Alcoa dedicates time for employees to perform community service. 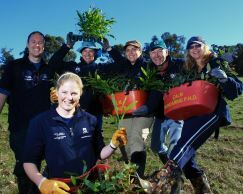 In the past three years, nearly 53,000 employees volunteered in over 2100 events in 36 countries. Activities range from planting trees, to serving meals, to repairing community facilities and helping students in local schools. Disaster Relief: Alcoa donated hundreds of thousands of dollars to the Red Cross in China after last May’s earthquake. They encourage employees to give, and make it easy to do so on their website. Alcoa and the Alcoa Foundation does good all around the globe, from Australian volunteers building and providing kids with wheelchairs, to helping community programs train and employ at-risk youth in the United States. Alcoa helps build bridges, both physical and metaphorical, in virtually every country in the world, and its impact on those communities is huge. Sponsored running events can be a great way to raise funds for your non profit organization. Runners and walkers are a close-knit group in most communities, and enjoy entering 5K, 10K, 15K, half marathon, and marathon races for charity. In return for their entrance fee, participants get a chance to post a good race time, reach a personal goal, and receive a goodie bag, a shirt, and free food. Your non profit organization receives free publicity, increased exposure, and a portion of the entrance fees! Your first step should be to form a race committee. Dedicated volunteers who are committed to putting in the time necessary to pull off a race are a necessity. Plan on at least six months for your volunteers to plan the race. Next, talk to a local running or sporting goods store. 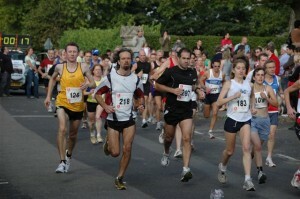 You may find that they sponsor or help produce a number of charity runs, and have great experience to share. Establish a budget. There will be plenty of out-of-pocket expenses, from fencing to timing chips, numbered bibs to advertising. Entrance and liability waiver forms will need to be printed, and you’ll need insurance, too. Set up plenty of spreadsheets and checklists—you’ll need them! Solicit sponsors. You’ll want to approach local businesses to give goods, services, or cash in return for publicity. Bakeries can donate bread, muffins, or bagels for runners. If asked, many grocery stores will donate fruit or water. Graphic designers might offer poster and ad layout services. Sign companies can give banners for the start/finish line, as well as directional signs for runners. Retailers can offer gift certificates for raffle prizes or goodie bags. You’ll need loads of volunteers; from pre-race publicity, distributing flyers, and charting the course, to race-day check-in, logistics, handling runners, putting out food, staffing water and first aid stations, traffic flaggers, and an emcee for announcements. Solicit volunteers early and often! Get the word out! Face-to-face networking at Rotary meetings and Chamber of Commerce events, along with social networking on Facebook and Twitter, blogging, and press releases are all going to be necessary. Get ready to start talking about your non profit fundraising race, stay within your budget and on schedule, and cross your fingers for fair weather on race day! October 5, 2009 has been designated World Habitat Day by the United Nations. Its purpose is to call attention to the dire need worldwide for safe, adequate and affordable housing. According to the United Nations, more than 100 million people in the world today are homeless, while millions more live without adequate sanitation, electricity and security. One out of three city dwellers lives in a slum. The need is truly staggering—more than 2 million housing units per year for 50 years are needed to solve the present crisis. Yet, even if they were all built, at the rate the population is growing, there will still be a need for another 1 billion housing units. What can we do? The first step is to just be aware—and to care. Most of us are lucky to have more than adequate housing—we’re comfortable enough to have a difficult time imagining what it must be like to lack sanitary facilities and clean water for our families. Compared to most of the world, we live in luxury. The housing crisis is not just some other nation’s problem—it’s a problem we can all come together to do something about. Advocating for change is the next step toward transforming the existing systems that perpetuate the global plague of poverty housing. In the US, about 95 million people—one-third of the population, have housing problems such as high-cost, overcrowding, poor quality, and homelessness. These conditions contribute to health problems such as childhood asthma, viral infections, anemia and stunted growth. Approximately 180 children die each year in the U.S. due to house fires attributable to inadequate electrical systems and faulty heating. Change can happen. Advocate for it by asking Congress to pass legislation to prioritize affordable housing. Educate yourself and your community about the problem here at home and around the globe. And donate to Habitat for Humanity’s efforts to end the global housing crisis.